Sunday, June 30th, I printed, wrapped, and FedEx-ed the first draft of my first book to my editor. I can't release all the details just yet, but it will have Guerilla somewhere in the title and will come out a little over a year from now. It aspires to be a field guide to building furniture out of scavenged materials, illustrated with 35 case studies of my own projects. Many of these projects have never been published before, while some are more detailed, better-documented versions of my most popular Instructables. Two copies of the first draft, 233 pages each, roughly 41,000 words. The book has been a long process. I have wanted to be an author since I was very young, penning execrable short stories and poems for English class. In high school, I got a few small awards for my poems, giving me the confidence (completely unfounded, as it turns out) to spend the next several years sending my work off to literary journals. Still pre-blog and, to some extent, email at that point, I would print copies of my work, a cover letter, batch them up in manila envelopes, and mail them off every couple of Saturdays. I kept track of my submissions on 3x5 cards, amassing several hundred of them over five years of college. I also amassed several hundred rejection letters, each of which I kept -- a peculiar monument, mixing motivation and shame in equal proportions. Years passed. I kept writing, fitfully, be it my journal or some more moony, miserable fiction, but my publishing ambitions flagged. The self-flagellation of sitting down and hammering out words was enough; I didn't need to thicken the stew with third-party judgements. In 2008, looking for a (free) web platform, I started posting projects on Instructables. It proved to be a comfortable niche, allowing me to combine two of my fascinations -- writing and design -- into one package. The internet allowed for instant feedback and a lot of guaranteed, instant readers, with no gatekeepers rejecting my content. My thesis in architecture school was a house for an author. Some of my writing (and my rejection letters) were part of my pin-ups, visible here in the middle row, all the way to right. Two years ago, after moving to Chicago, I started this very blog. I figured it would allow me to write on a wider variety of topics that interested me, sharpen my skills as a writer, and serve as a form of writerly calisthenics -- the discipline of putting together an essay (or close to it) every week (or close to it). It would also serve as a set of writing samples and a platform for promoting myself as I looked for work in a new city. The blog helped me land an article for Design Observer, which got a good response around the web. Around the same time, I got an email from Philip Schmidt. He was writing a book called PlyDesign , and wanted to feature one of my projects that he had found on Instructables. After that book came out, he put me in touch with his editor, I put together a proposal and some writing samples, and the process moved along until I signed a contract in December. Since then, I have come home from work each evening and put in hours at the keyboard or the sketchbook. I became a bit of a hermit, spending every Saturday at the shop prototyping new projects. It was a lot of work to do on top of a full-time job. One of my reference sketches (for the illustrator to work off of) for the introductory section. Though it seems, in the popular press, that books are dying a horrible death, they are in fact doing quite well -- better than ever, in fact. Certain segments (including cooking and how-to) are flourishing. E-books are growing exponentially with tablets and e-readers. Again, how-to books are especially suited to e-book versions, as rich multi-media content can be embedded right into the text. And, while the web offers a vast array of DIY writing, it suffers from that very vastness -- it is hard to find good-quality information that has been thoughtfully vetted, edited, and shaped. Books offer a certain baseline guarantee of quality that allows the consumer to make an informed choice. 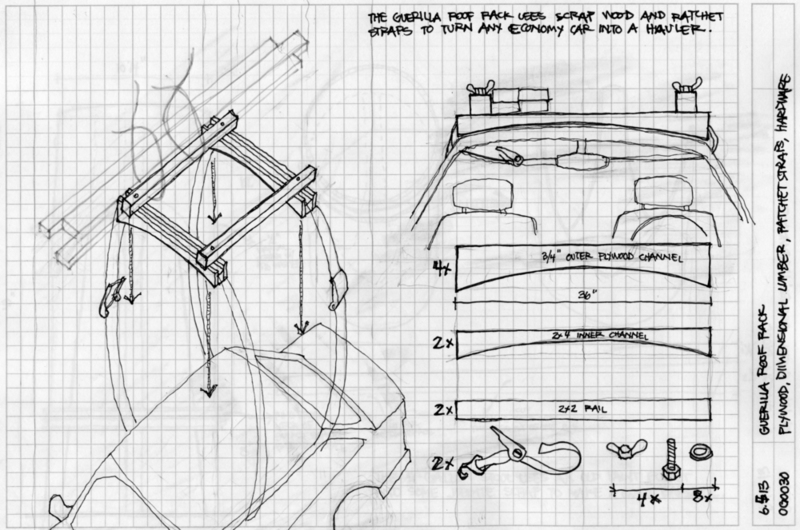 Reference sketch for the Paper Tube Table. I will keep posting updates about the book as publication draws nearer. In the meantime, OG will be going quiet for a few weeks as I take a much-needed vacation and undertake another cross-country move, this time returning to my hometown of Baltimore.